USS Dahlgren Combines Simulation with Live Fire - Go Navy Go! Testing new weapons and coordinating them with existing weapons systems is expensive. Imagine keeping ships at sea at a daily cost of up to $1 million just to test and coordinate weapons systems. Now imagine reducing the cost by more than half by simulating the same test using a computer. The USS Dahlgren is a cybernetic laboratory located at the Naval Surface Warfare Center in Dahlgren, Virginia, that tests integrated naval weapons systems by simulating Navy assets and enemy threats and also employing live-fire weapons systems. Last August, for example, the shore-based Dahlgren coordinated a weapons test along with virtual representations of the aircraft carrier USS John C. Stennis (CVN 74), cruiser USS Bunker Hill (CG 52), and littoral combat ship USS Independence (LCS 2) during live-fire destruction of surface targets. What’s new is the ability to include various vessel types while simulating a real-life enemy engagement. You may remember my previous blog about the railgun. USS Dahlgren helped develop and test this amazing weapon. The Navy released a video that shows off these testing capabilities. Let me walk you through the video so you’ll better understand what you’re seeing. The first few seconds are kind of a sneak-peek overview. You’ll see a split screen showing an actual 30-millimeter gun and a simulation of two enemy vessels. The gun engages and disables them. After this clip, the actual demonstration begins. First we see two simulated threat vessels. An unmanned aerial vehicle is then launched to track them. Then the Navy engineers attempt to use a MH-60R Seahawk surface attack helicopter to engage the threat. They are forced to withdraw due to small arms fire from the enemy. No problem for us. 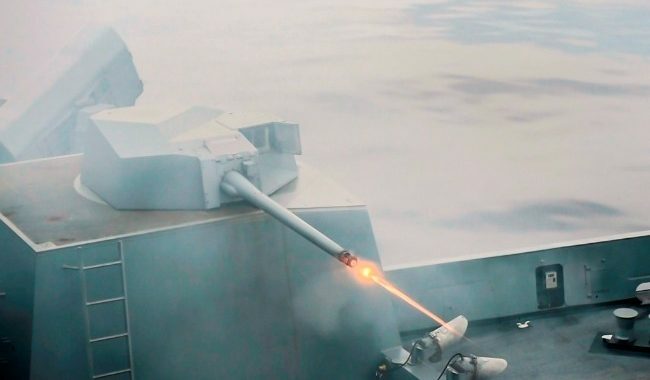 The crew switches to an Aegis MK 46 gun system’s 5-inch naval gun. Remember, you’re watching actual guns with simulated vessels. Initially, the shots are a bit off target. The engineers use the Virtual Automatic Scoring System (VASS) to calculate gunfire miss distances and to adjust targeting and help the gunner converge gunfire onto a target without risking the lives of forward observers. On the third salvo, the target is destroyed. After this, a second scenario begins. The unmanned vehicle spots another threat. This threat is engaged by the 30-millimeter guns. With the help of VASS, the guns zero in on the threat and disable it.